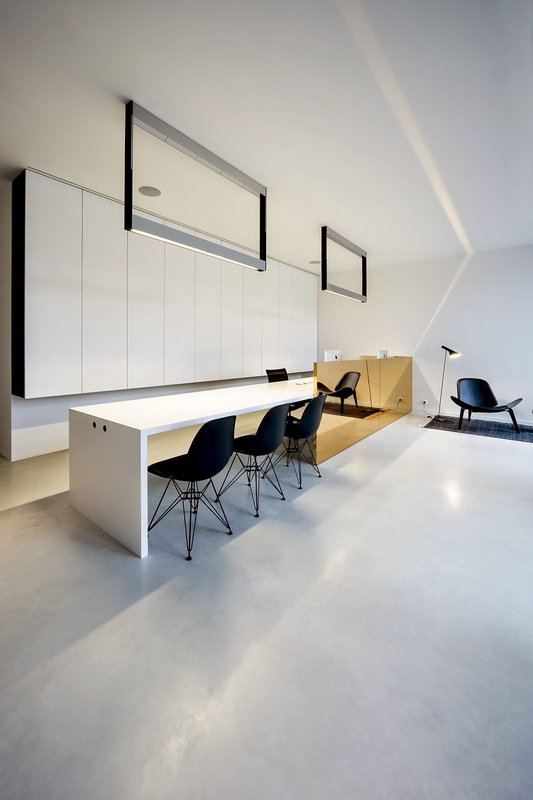 Interior architects imore | interieurarchitectuur have recently designed an office space for their design practice in the area of Malle in Antwerp, Belgium that reflects their own minimalist style and vision on interior architecture. 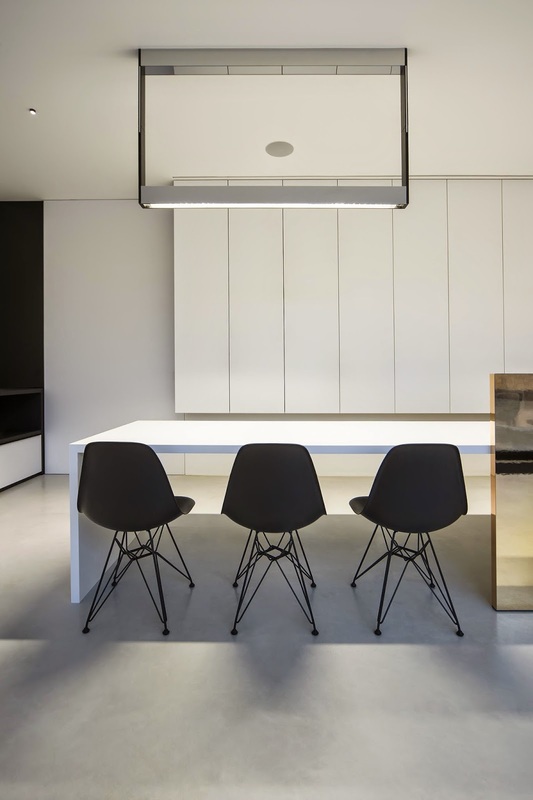 Based on a carefully chosen restricted palette of materials, tones and forms, focus is given on the purity of space and the importance of light and details. Already since the design of the office we wanted it to have a double function. It mainly serves as our personal workspace and to warm welcome our visitors. On the other hand it serves as showroom that captures our style and vision. imore's vision is represented in the entire office. 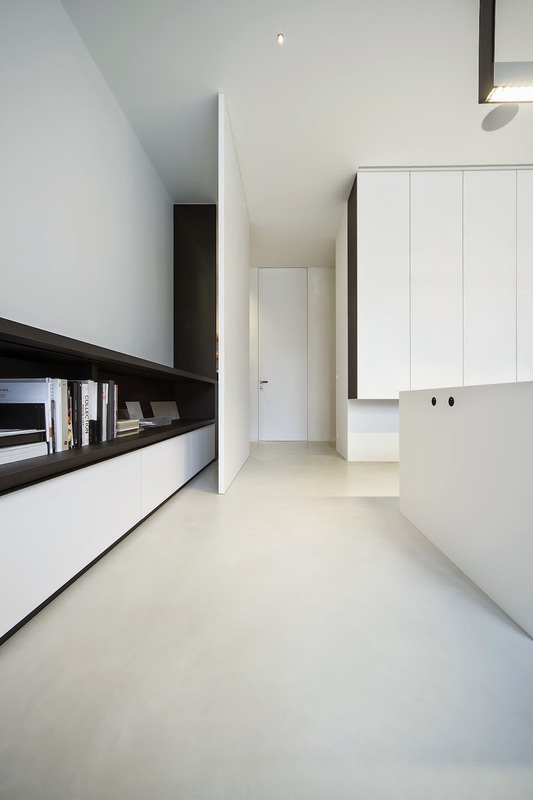 Volumes, surfaces and lines have been deliberately chosen to obtain a pure minimal overall concept. Furthermore we attached great importance to the use of different materials, lighting and details. For our office we have chosen for an open character with a full glass facade. 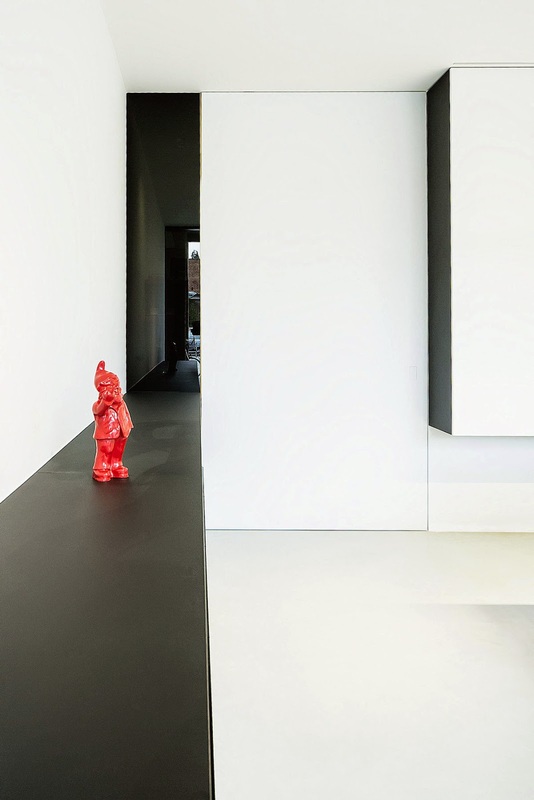 Against the glass facade we created a low black volume as a showcase furniture. It seemlessly extends into a black carpet in front of the door. 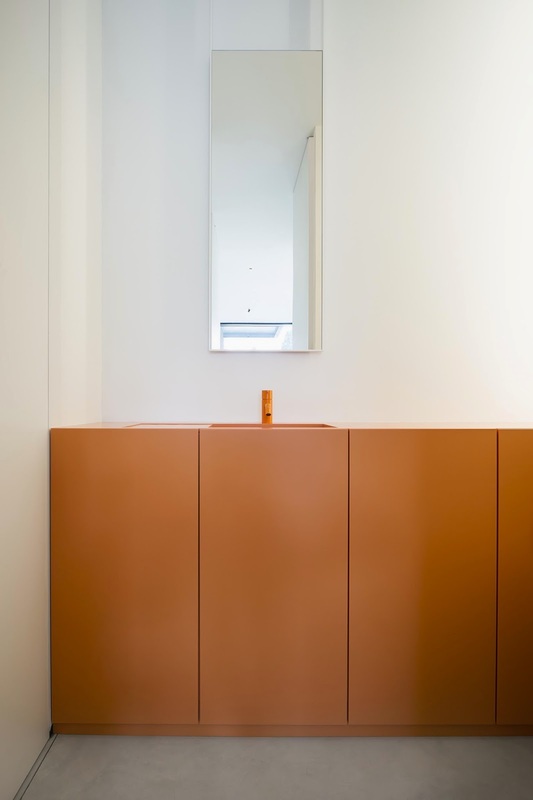 The office is divided into two zones by means of a central volume in red copper with purpose to hide our desk. In front of the red copper volume, we receive our customers, while behind the volume we located our desk with three workstations. The entire desk is created out of one volume which we divided into three parts. 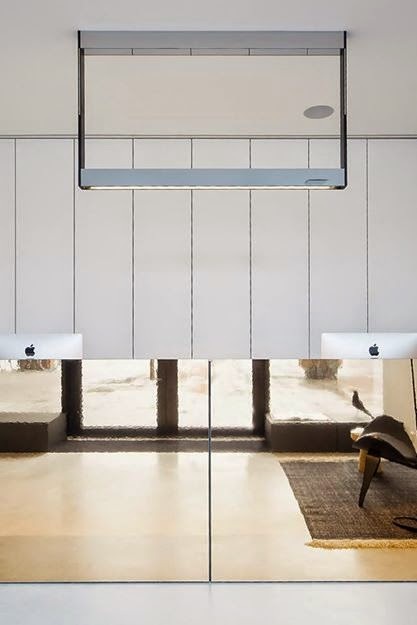 Two parts that serve as workspace and a third part as a meeting table. The back wall extends into a large rotating wall in order to separate the open office from the back office. 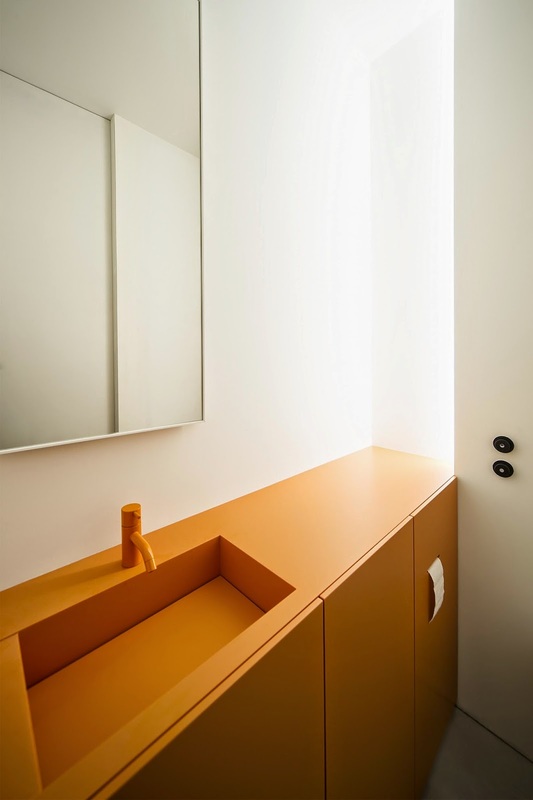 In the back office we installed a kitchenette and the toilet with a bright orange washbasin that colors the entire space. 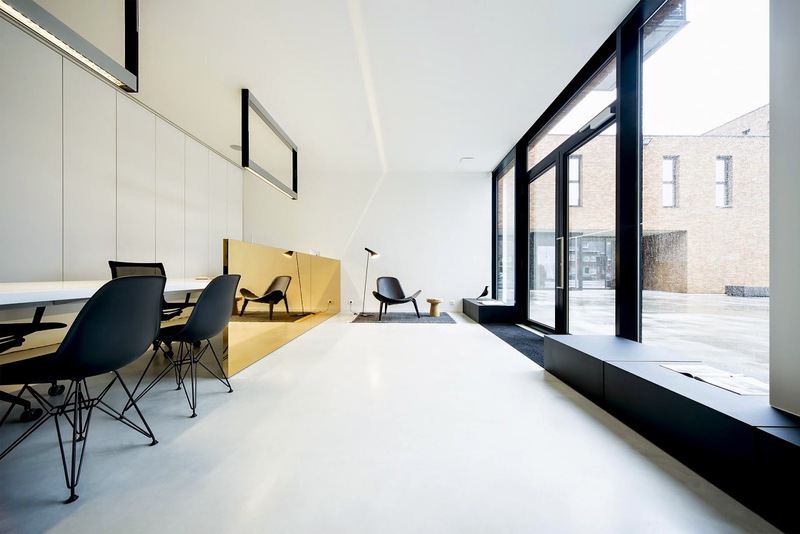 By giving it an extra personal touch,the imore office reflects our clear vision on interior architecture.